The Watersedge Community Drama Group will treat the residents of Dublin 4 to a performance of The Tenements on Sunday 24th, Monday 25th and Tuesday 26th of May. 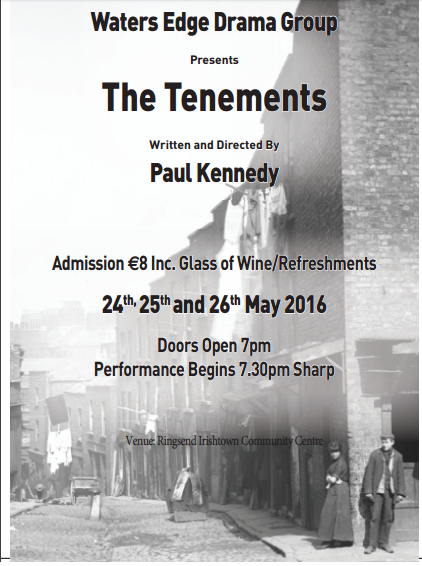 Written and directed by Paul Kennedy, The Tenements will be performed in the Ringsend & Irishtown Community Centre. The show will begin at 7.30pm sharp on each of these evenings, with the doors having opened at 7pm. In the hands of the award-winning performers behind 2014’s tragi-comedy The Family Feud, this is sure to be a play to remember. Admission is €8, which includes a glass of wine and refreshments.